Dogs are curious creatures who have a knack for finding things they shouldn't. Snails and even traces of snails infected with lungworm parasites are among them. Treatment of lungworm parasite is available. Prevention begins with ridding your living and garden areas around your home. Slugs and snails, scientifically known as gastropods, live all over the world, from Asia to North America. Gastropods prefer damp habitats, although they are sometimes found in dry habitats that have ample dark and cool shelters. These critters seek shelter in fallen leaves, mulch and wood stacks, turning gardens and other vegetation into food sources and breeding grounds. Mostly active at night, they leave travel trails behind, making their presence known in the daytime. Slugs and snails are not parasites, but they host parasites. 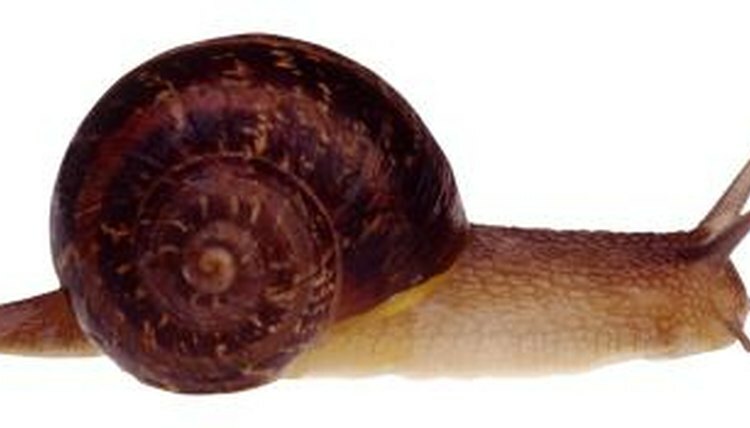 The lungworm (Angiostrongylus vasorum) is a common snail and slug parasite. The parasite's life cycle begins in an infected gastropod, where adult worms produce larvae. The infected gastropods crawl along grassy surfaces or in stagnant water, leaving stool containing larvae behind for dogs or cats to accidentally consume -- or gastropods themselves may be consumed by curious dogs. The larvae travel through their new hosts' bloodstream to the lungs and heart, where they grow in to adults and start laying eggs. The eggs hatch in the lungs, then travel through the airway; they are swallowed and eventually passed through stool. Gastropods eat the infected stool, and the life cycle begins again. Consuming infected gastropods or ingesting water, grass or residue on dog toys containing lungworm larvae causes several signs of medical illness in dogs, including respiratory distress, bleeding, coughing, vomiting, weight loss, abdominal pain and fainting. If left untreated, the parasite can eventually cause hemophilia, whereby blood does not clot properly. This condition is life-threatening, even if your dog has the smallest wound. Call your veterinarian if your dog has any of these signs. Treatment of lungworm occurs through eliminating the parasite through medications as well as through blood transfusions and oxygen therapy. Prevent snails and slugs from building a paradise in your gardens and around your home by using snail prevention techniques such as pellets, organic sprays or a mixture of vinegar and water around your plants and landscaping. Do not allow your dog to play outside unsupervised in grassy areas or around your garden, as he may try to interact with or ingest infected gastropods. Rinse all outdoor pet toys with warm water and soap before allowing your dog to play with them. Additionally, rinse all vegetables from your garden thoroughly before adding them to your dog's raw food.